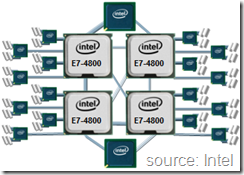 4 Socket Blade Server – Which Intel CPU Do You Choose? examine what the differences are. Last month, I discussed the details of the Intel Xeon E5-2600 CPU, including its ability to have up to 8 cores per CPU, 24 DIMMs (per 2 socket system) and direct integration of the PCIe lanes into the CPU architecture. The Intel E5-4600 v2 processor builds off of the E5-2600 environment allowing scalability up to 4 CPUs and 48 DIMMs as well as direct integration of PCIe lanes into the CPU. The biggest difference between the 2 socket E5-2600 v (other than the increase in CPUs and DIMMs) and the 4 socket E5-4600 is that the E5-4600 uses a single Quick Path Interconnect, or QPI, to communicate to its peer CPU, a key differentiator compared to the Intel Xeon E7-4800 v2. The Intel Xeon E5 family also updates Turbo Boost and adds new Advanced Vector Extentions (AVX), but for the context of this article, I won’t be going into these features in any detail, but I encourage you to click through the links for details. Intel’s Xeon E7-4800 v2 is technically in a different “class” of CPUs compared to the E5-4600 v2. They are both expandable, but the E7-4800 v2 is based on the Intel Ivy Bridge-EX CPU and is considered an Enterprise class CPU. The E7 CPU family has an increased CPU core capacity of up to 15 cores (30 with Intel’s Hyper-Threading feature) and has up to 37.5MB of last level cache that is sharable across all cores. 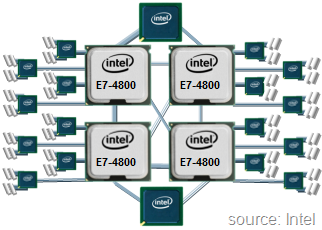 The E7 family of CPUs from Intel offers integrated memory controllers with 4 channels with speeds up to 8.0 GT/s and has 4 full-width Intel QuickPath Interconnects linking all 4 CPUs together. 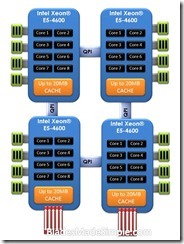 Below is a comparison between the Intel Xeon E5-4600 and the E7-4800 CPU. In summary, the Intel Xeon E7-4800 wins in max CPU cores, cache, memory density and QPI connections, but the Intel Xeon E5-4600 wins all other categories. 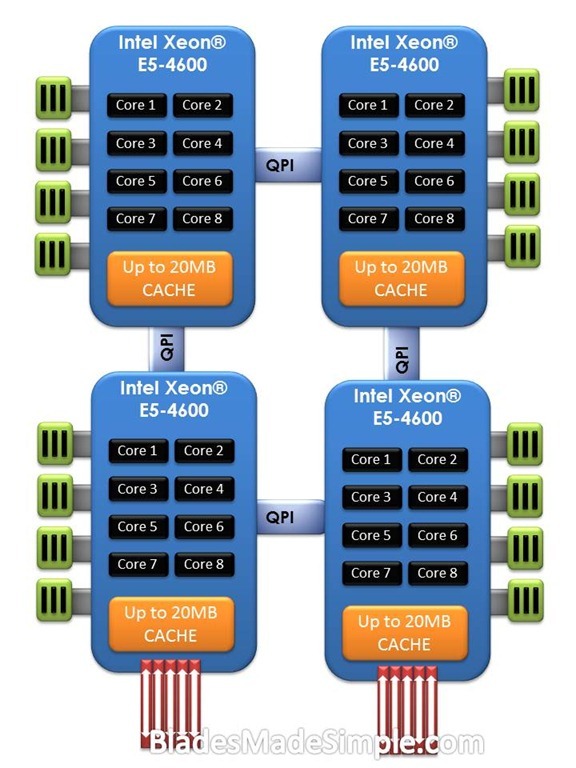 UPDATED 8.7.12 – a few people have commented that the Intel Xeon E7-4800 architecture will scale to 8 CPUs. This is NOT the case. The E7-8800 will scale to 8 CPUs but NOT the E7-4800 (reference: http://ark.intel.com/products/53571/Intel-Xeon-Processor-E7-4860-(24M-Cache-2_26-GHz-6_40-GTs-Intel-QPI). I originally left out this knowledge because I didn’t think it applied to blade servers but since then I’ve been corrected that a Tier 2 hardware vendor has an 8 CPU blade server (which is really 4 blade servers crammed into a 5u chassis). That being said – it still doesn’t relate to the E7-4800 at the time of this writing, you will not find an 8 CPU blade server offering within any of the blade server vendors who are in the top 4 market share. One of my readers, @kevinclosson, recently commented that “no mention of 2-hop remote references with E5-4600” and he is right and it probably warrants some thought. In the Intel E7 architecture seen above, you can see several cross bridge links which allow for CPUs to access memory across different memory controllers without additional latency. However, if you refer to the SPEC CPU2006 int_rate base benchmark and look at the difference between the Intel E7-4850 10-core CPU with the E5-4650 8-core CPU, there is an 83% improvement with the E5 architecture. (Note the same two CPUs show the E5 with a 152% gain using the SPEC CPU2006 fp_rate base benchmark.) So does the fact that the E5 uses two hops vs the E7 make a difference? The benchmarks say no, but I’m sure there are other factors that weigh in, so I welcome any thoughts. If you are interested in finding out what each of these features provide, I encourage you to contact your local Intel rep (or server partner.) The point, though, is that there are a lot of other pieces that factor into the performance of the server that should be considered when deciding what server CPU you need. Benchmarks are also a good indicator of which CPU you’ll want to use, but finding a benchmark that compares the Intel E5 family with the Intel E7 is hard to come by – but I’ve got you covered. If you have memory intensive enterprise-level applications, you will want to use the Intel Xeon E7-4800 v2 CPU. For General Purpose, or High Performance Compute work, go with the Intel Xeon E5-4600 v2. Kevin Houston is the founder and Editor-in-Chief of BladesMadeSimple.com. He has over 17 years of experience in the x86 server marketplace. Since 1997 Kevin has worked at several resellers in the Atlanta area, and has a vast array of competitive x86 server knowledge and certifications as well as an in-depth understanding of VMware and Citrix virtualization. Kevin works for Dell as a Server Sales Engineer covering the Global Enterprise market.